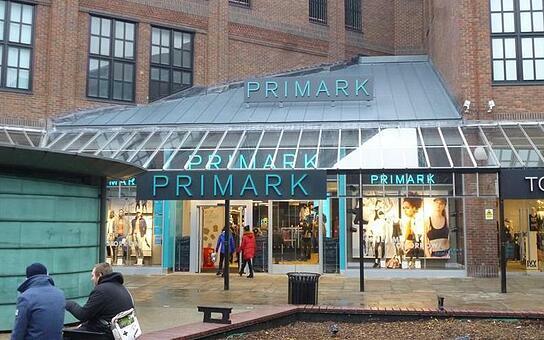 Whatever your opinion of Primark, it can’t be denied that it is a very interesting retailer. Whilst the fashion market as a whole is coming under increasing pressure, and bricks and mortar clothing and footwear stores report falling footfall and sales, for Primark the opposite is the case. Even with the challenges from the never-ending Brexit saga, some rather dodgy weather in the first half of the year (a distant memory now!) and general consumer confidence sliding, Primark reported that sales rose 6% in the 40 weeks to 23 June this year and anecdotally, now the heat wave has hit, sales of summer clothing and swimwear is boosting sales further. To add some more context into what makes these results so interesting is that Primark mostly operates out of large format physical stores, often on multiple levels, with the majority of stores on the high street or in shopping centres, selling a huge range of products with no e-commerce functionality on their website whatsoever. Whilst general market chatter talks about the ‘death of the high street’ (I’m hoping you know LDC’s opinion on this by now! ), how online is nabbing the fashion sales (we’re looking at you, ASOS) and how retail parks are the shopping choice of the future, Primark is going against the grain on all three of these issues, growing in market share and generally going from strength to strength despite being a high street fashion retailer who operates solely from physical stores. 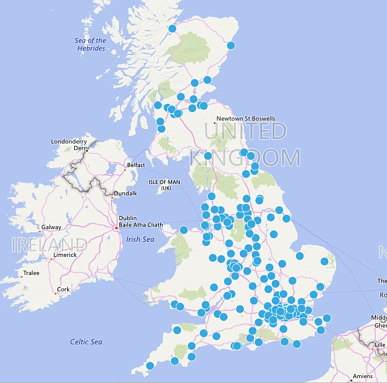 LDC data shows that currently, Primark has a total of 176 UK stores spread pretty evenly across the county (see figure 1 courtesy of LDC’s location insight platform, LDO which plots all store locations onto a map of GB). However, reach is expanding beyond our shores and they have a number of stores across Europe and the USA. In Britain, Primark’s stores are predominately located on our high streets (38%) and in our shopping centres (54%), which incidentally are the two location types which are faring the worst in terms of vacancy rates at 11.2% and 13.2% respectively as released in our latest free market report. Just a handful of Primark’s stores are situated on retail parks, which is surprising given the large footprint of most of their stores. There could be a expansion opportunity for Primark with the recent CVA activity from some key retail park retailers leaving units available (Primark – if you are interested to know where these are - get in touch!). As LDC data is continuously updated by our field researchers, we’ll be keeping a close eye who the takers are of the these soon-to-be vacant retail park units. Primark’s estate is fairly stable and in the past 12 months, they have opened up four new stores in London, Bracknell, Uxbridge and Staines with four sites relocating within an area; Oxford, Grimsby, Kingston Upon Thames and Norwich. This is notable in a sector which is in decline overall (in 2017 we lost 889 women’s clothing, shoe and general fashion shops across GB) and, looking at a few of Primark’s competitors; New Look, Matalan and Peacocks you can see that a modest net increase of three stores in the last 12 months brings Primark above similar retailers. Another interesting point to note is that Primark has the smallest estate of these four retailers, and by some margin. Whilst an increase in three stores over 12 months against a backdrop of rising sales and increasing footfall may seem cautious, I would argue that size, does not necessarily matter when it comes to retailer reach and footfall. Primark have opened stores in densely populated areas where their target consumers are likely to be, with just enough to reach the majority of potential customers, but little enough to control operating costs for the business. Alongside this, if your product is so distinctive and your marketing so compelling that consumers will travel to visit one of your stores, a complex, costly and operationally demanding online sales platform becomes less attractive. Firstly, whilst Primark doesn’t have any online sales provision, they do in fact have a very innovative, engaging and impactful website. Everything about Primark.com drives the consumer back to store and encourages engagement with the brand. The website includes a magazine-style features section, where latest trends and Primark product ranges are discussed, a product section displaying images and prices for all products stocked (but no ability to make a purchase), a section called ‘Primania’, store search functionality and then a prominent section on Primark’s ethical code. The ‘Primania’ section is essentially Primark’s own social media platform, just in a miniature form. 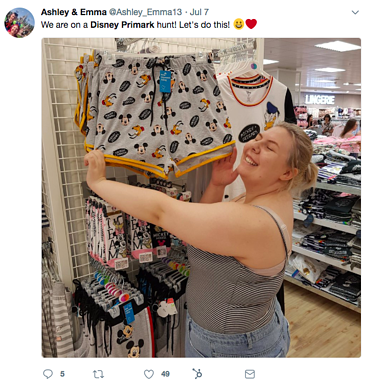 Consumers are encouraged to upload images of themselves wearing Primark fashion, and other users are able to award ‘Primarks’ to the styles they like the best. This works so well as it is an appealing and easy way for consumers to evangelise the Primark brand. Users of Primania also are required to name check the store they bought a particular outfit from, again, driving viewers back into store. Running throughout the site are options and reminders to share images on Facebook, Twitter, Pinterest, Instagram and Google+ further sharing Primark products across its reportedly 12M+ social media followers. Another thing that Primark seems to nail is its product selection. Whilst Primark products aren’t known for top quality and their long-lasting nature, they do seem to know exactly what consumers want. 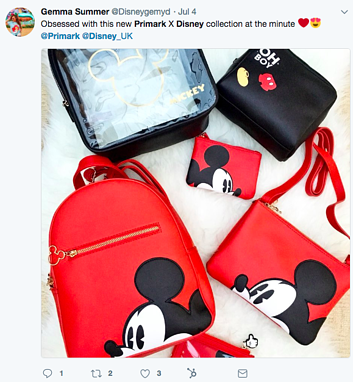 For example, recent Disney, Harry Potter and Friends collections within their fashion, kids, home and beauty ranges have been met with a social media frenzy with many consumers desperate to get their hands on (and then show off) items. It is this ability to know what Primark consumers want and to get it on shelves quickly that pays off, often replicating much more expensive products sold by other brands in a cost effective and appealing way. For years Primark has faced rumours about the provenance of their products and the ethics of how clothes are made. With such low prices, Primark has been hit with rumours of sweat-shops, child labour and low wages for those working in the factories producing products for the retailer. Instead of shying away from rumours they have opted to face them head-on with a dedicated section on the website explaining the measures they have in place to protect workers at every stage of their supply chain. This also acts as a great way to showcase how Primark’s ethical code aligns with consumers, showing customers that they care, strengthening their position as the high street retailer of choice for consumers. But I thought the high street was dead? Finance Director for ABF (Primark’s owner) John Baston recently was quoted as saying ‘The high street is not remotely dead’ and this is something at LDC we would heartily agree with. Our data reveals a shift in expectations and use cases for the British high street; an evolution, rather than a death. Retailers such as coffee shops, barbers and beauty salons are all on the up (624 new Barbers opened in 2017), whilst the more ‘traditional’ retailers are declining, including banks which lost 711 units in 2017 alone. Whilst it can’t be denied that there are many economic, cultural and political challenges in the market, the success of Primark evidences the fact that digital is actually a huge opportunity for the high street in driving footfall to stores and not a threat, as commonly reported. Whilst many ‘traditional’ retailers are struggling to stay afloat in today’s market, it could be that these businesses were not quick enough or did not have the resources to stay relevant to consumers – embracing and adapting to a new world where being at the forefront of technology is no longer a competitive advantage, it’s a necessary factor to enable the sustainability of a retailer. If that is the secret to success, it’s time we start sharing it. To find out more about what LDC data tell you about any brand and its portfolio, download more information here.